Champagne isn’t usually on the menu at training camps, but here in Majorca the flutes were handed round the first night we arrived. But it wasn’t to welcome us to Alcudia, it was to celebrate Ben Swift’s stage-two win in the Tour Down Under earlier in the day. Swift is a product of the British Cycling system and now rides for Team Sky. His win in Mannum was his first in a WorldTour (formerly ProTour) level race, completing his journey from junior knocking around in local races to the world’s elite. So after dinner, Swift’s team-mates from both Team Sky and Great Britain’s endurance track squads gathered in their hotel restaurant to toast his win and send a picture of them doing so to the team in Adelaide. There’s a lot of people here and the camera’s lens struggles to get everyone in. Around 25 staff and 35 riders were in the cycling-friendly, yet peculiarly named, Hotel Vanity Golf last week. After 14 years staying at The Galleon in Port de Pollenca, they changed locations as it’s temporarily shut. Tollo, the owner of a restaurant in Port de Pollenca, is BC’s contact on the island and is well known in cycling circles. After a few phone calls he’d persuaded the owners of this hotel to open two months earlier than usual and staff the place. You’d think having to call people to work two months earlier than normal might cause a few issues, but in fact they couldn’t be more helpful. Cyclists get treated well on this island; pro cyclists are almost royalty. Not even the chef minds that the team has its own. In some countries they’re resistant to outside chefs coming in, but not here. Soren Kristensen, a big, yet softly spoken Dane, has taken up residence in the hotel’s kitchen and hasn’t met with any resistance. Soren is never out of his Team Sky apron and cap, and has even stuck some blue insulation tape down the front of his black trainers. It could catch on. He provides all the riders, staff and guests with their food. It’s nothing fancy, but his trick is to take simple food and make it interesting. While the GB riders, all looking ahead to the Manchester track World Cup next month, benefit from Soren’s cooking, Team Sky riders benefit from the GB staff whose jobs cover both sets of riders. It’s this sort of integration that Dave Brailsford was looking for when he set up the British pro team. That didn’t happen last year; Sky went to Valencia for their first training camp, held largely behind closed doors, while the British squads stuck to the familiar terrain of Majorca. If anything, in the first year Team Sky took staff away from the BC set-up. But this year Sky’s approach is very different. Brailsford, who mixes his role as Sky’s team principal and British Cycling’s performance director, promised a more relaxed approach to 2011, and a season that wouldn’t be so intensely focused on just one race. So far, so good. The riders are approachable, and when I tag on the back of the group for a two-hour ride (see separate story) I get teased for not doing my turn on the front rather than scowled at for getting too close. Although there’s some hard training going on here (blocks of three hard days are followed by a rest day. The hard days are up to six hours and can include team time trial efforts, five-minute efforts on the climb to Formentor, mock races and/or sprint lead-outs) they’re not being dictated to. The hotel has been booked since the beginning of December, and riders and staff, both Sky and GB, have been coming and going at regular intervals. While the track riders are following a more regimented programme, Sky riders have been free to come and go to this camp as and when they want. Some riders don’t like being away from home for two weeks at this time of year, others don’t need to be, so instead they were asked to do at least seven days. Several have ended up staying longer, and most are in their second stint here. “We’re a year wiser – that’s probably the single biggest change,” said Dave Brailsford. “I think we’ve had time to look at ourselves and how we performed as a staffing team. We’re probably a little more confident, and that makes you a little more relaxed, you’re going into the known, and not the unknown. It’s not just the atmosphere around Team Sky that’s changed, a lot of staff came and went in the off-season. By the time the team has recruited its senior partner manager and director of communications, the whole team, riders and staff will number close to 90 people. “From the end of autumn until Christmas I’ve been able to take stock and get back on top of everything,” says Brailsford. “The guys at BC have been doing a great job, Ian, Jan and Dan. Now Chris Newton has picked up the Academy, I think across the board we’re in great shape. 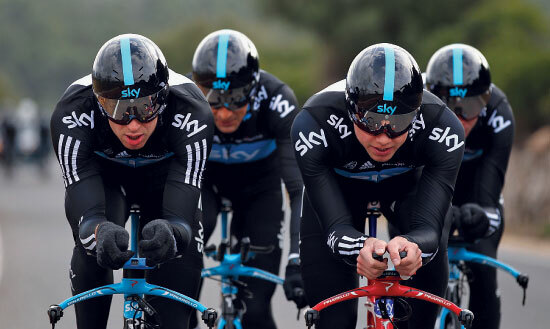 “The one thing I always wanted was for Team Sky to benefit British Cycling’s 2012 opportunities, and I can see it now. Here we are all integrated together: the GB women’s team pursuit [squad] here with one of the world’s biggest pro teams and it’s all working. “Swifty, G and Brad have all held their hands up and said, can we all take a look at the team pursuit, and we can sit here and say, OK, your race programme can be this, yours can be this, we don’t have to ring anyone and ask them if they can do it. We decide how we can get them in the best shape they can be. Team Sky caused a wobble at BC last year, but with Swift winning twice in Australia (and gaining vital points for Worlds and Olympic qualification), and the new Olympic Academy riders winning medals at the Beijing World Cup things look back on track. With 2012 round the corner, this ambitious attempt at integrating pro and national squads might just come off at the right time. If you come to the island of Majorca and don’t ride your bike then you can’t call yourself a cyclist. Mine was packed as soon as my flights were booked, and it was the first thing to get unpacked when I got here. I was ready for a few pre-breakfast rides, but on my first day here I got the chance to ride with Team Sky. They were on an easy day with just a three-hour ride scheduled. The first hour was spent filming for Sky, after which they had a brief stop to change back to training wheels. This is where I jumped in. Although they weren’t waiting. Except for Russell Downing that is. The Yorkshireman held back while I got my bike out of the van and rode me up to the group. Whenever I get to ride with pros I’m always content to just sit on the back and generally stay out of their way. I’m perfectly happy riding in a bunch, but what if I made a mistake, brought half of them down and caused a broken collarbone or two? Just when I think I’m doing the right thing, Servais Knaven and Steven de Jongh (one of the most followed Tweets in the Netherlands no less) pull up alongside me in the car and warn me that I can’t go for the sprint if I haven’t done a turn on the front. I figure they’re winding me up and stay where I am. Coming into Pollenca I start chatting with Bradley Wiggins about all things cycling, from the National ‘10′ to Lance Armstrong. Before I know it we’re almost at the end of the bay road and I’m sitting in fourth wheel. Downing has already promised to lead me out, but this turned out to be one of the few rides where no one rose to the bait. Edvald Boasson Hagen time trialled off the front, but no sprint unfolded behind him. Perhaps they’d heard that I had a mean jump on me and didn’t want me to show them up.